For many families and people of all ages, this is the time of year when you spend the most time thinking about organization and logistics. It’s back to school time and that means many things to many people. If you have younger children, it means your family will be scrambling to get supplies and preparing for your daily routine. If you have older students in your family, this is the time of year that you’re either moving to or looking in to housing on or near campus. If you teach or are employed by a school, you’re in the process of getting your facilities ready for another school year. Whatever your situation is, A.B. Richards can help you with portable storage containers. A.B. Richards is in the business of helping people get organized. We rent portable storage containers to give you extra space. We will deliver them to wherever they’re needed and we’ll also pick them up when you’re done with them. We’re a rental company, so we can’t allow you to repurpose one of our storage units into an office or classroom, and we can’t sell you a storage unit, but we want you to know about ways A.B. Richards can help you for back to school. If you’re getting a child ready for school, it’s a good idea to get a checklist together for what you need. The Atlanta Journal-Constitution suggests checking around the house and seeing what supplies you may have left over from last year. You also need to pick out outfits for the first day of school. Wearing a nice outfit that your child loves is a good idea on the first day of school, because there are often photos taken that day. A nice outfit can also improve self-confidence. Preparing a student for the start of the college year is much more involved. Particularly when it involves relocating to a different location. According to the Houston Chronicle, you need to bring items that aren’t provided by the school in the dorm room and if you’re living in anoff-campus apartment you may need to bring things like furniture or beds. 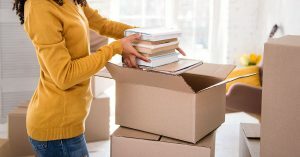 Many college living spaces are cramped and if you don’t have the room, you might want to think about storage for what you might need that won’t fit in your space, as well as for seasonal clothing. Storing items near an off campus apartment can keep you from having to lug or shift things back and forth between home and school. Extra storage can also come in handy if you’re a teacher, administrator or facilities manager. Back to school can often mean that space is at a premium and you may be looking for ways to store files, books, papers or grounds keeping and athletic equipment. A.B. Richards can help you with these storage needs. If you’re gearing up for a new school year and you have storage issues, A.B. Richards can bring sturdy, secure storage containers to where you need them. All of our containers are made from 14-gauge steel and the doors are padlocked. We can make storage easy and convenient. Contact A.B. Richards today. « A.B. Richards is Everywhere!